Nick Noonan collected three hits and two RBI in the Giants’ final Spring Training game in Arizona this year, only improving his chances to make San Francisco’s Opening Day roster. The left-handed hitter got off to a slow start this spring, tallying only one hit in his first 19 at-bats. Since March 9th, however, Noonan has turned it up by hitting .341 (15-for-44) with eight extra-base hits. With veteran infielder Tony Abreu sidelined with a knee injury for all but one Spring Training game, Noonan has stepped up his candidacy for a backup infielder role with the Giants. Noonan entered last season with a .259 career average. 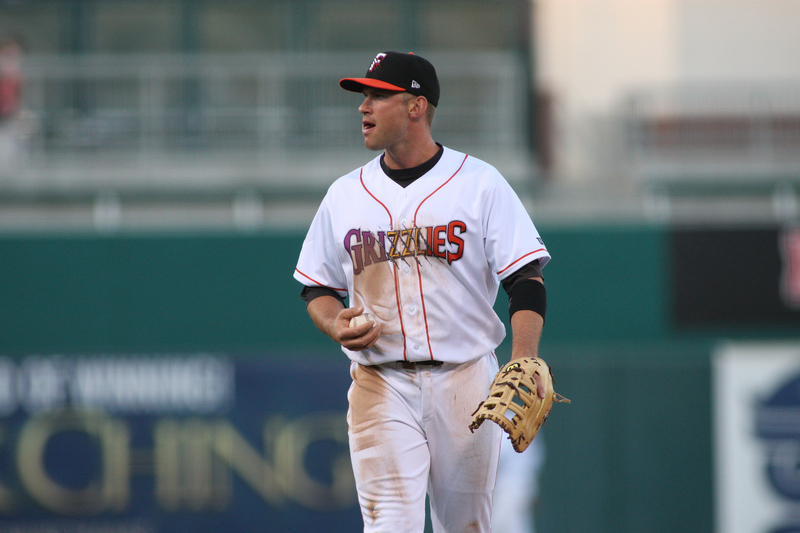 He played in 13 games for the Grizzlies in 2011, but the 2012 campaign was Noonan’s first full experience at Triple-A. The San Diego native impressed, batting .296 over 129 games for Fresno. He paced the Grizzlies in hits and games played while also placing fourth on the squad with 62 RBI. “I’ve known Nick from day one, so I asked him, `When we drafted you and you were considered a top prospect, what were you good at?’” said Decker, now the Giants’ organizational hitting coordinator. Noonan and Giants fans alike will find out in the coming days if he cracks his first big league roster. Did the Grizzlies’ roster just take shape? Several moves were made today at the San Francisco Giants big league spring training: 21 players were reassigned to minor league spring training. Several players were optioned to Fresno’s preliminary roster: Ehire Adrianza, Nick Noonan, Juan Perez, Roger Kieschnick, Jake Dunning, Chris Heston, Dan Otero, and Sandy Rosario. Each of these players is on the Giants 40-man roster. Looking at the list of cuts today, most stand out as potential Grizzlies on Opening Day (April 4th). Adrianza and Noonan appear to be future Grizzlies up the middle of the infield. While Noonan has experience at second base, third base, and shortstop, Adrianza has played in 582 career games at shortstop and 1 at second base. Bond has played both second and third base in his career. The switch-hitting, on-base machine could fill wherever Noonan is not playing (or vice versa). Perez and Kieschnick are going to be a part of a potentially loaded Grizzlies outfield to start the season. Perez has spent the last two seasons at Double-A Richmond, including a 2012 season in which he batted .302 with 11 home runs and 18 stolen bases (33 attempts). 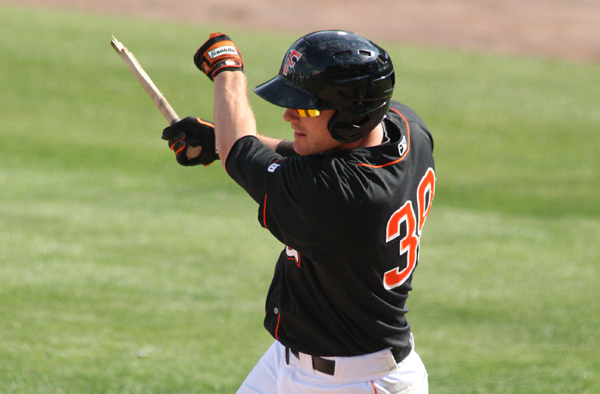 Kieschnick, despite missing three months with a shoulder injury, led the Grizzlies with 15 home runs in 2012. Other possibilities in the Grizzlies outfield include Brown, the Giants’ 2nd-best prospect according to MLB.com, and Francisco Peguero. Peguero has stood out this spring, batting .424 in 13 games with the big club. He is competing with Cole Gillespie, Andres Torres, among others, for a spot in the Giants outfield. LaTorre was assigned to minor league camp after returning from his time with Team Italy at the World Baseball Classic. LaTorre appeared in 2 games with Italy, going 1-for-4 with a walk. Bonser, Heston, and Kickham are the frontrunners for the Grizzlies starting pitching staff. Bonser used the 2012 season to recover from Tommy John surgery. The right-hander started out of the bullpen with Fresno last July, but slowly worked his way back to a starting role. In 307 career games, Bonser has started 245 of them. Heston and Kickham are the rising prospects, who recently gained the attention of the Giants brass. Heston was the Eastern League Pitcher of the Year last year while Kickham is a hard-throwing left-hander. Those can be hard to find. Dunning, Edlefsen, Hembree, Lively, Loux, Otero, and Rosario are candidates for the Grizzlies’ relief corps. Loux has plenty of starting experience in his career, but he pitched solely out of the bullpen in 2012. Rosario is the latest addition to the Giants organization. The right-hander posted a 1.04 ERA in 25 appearances with the New Orleans Zephyrs in 2012 while leading the team with 16 saves. The Grizzlies’ co-leader in saves from yesteryear, Hembree, will be looking to improve himself in the early part of this season to make sure he can crack the Giants’ roster soon. 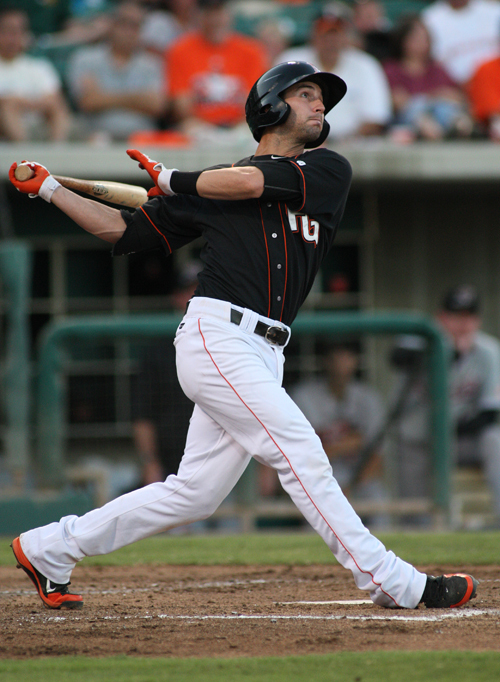 The Fresno Grizzlies are looking to snap two losing streaks tonight. After starting the season with eight consecutive victories in series openers, the Grizzlies have lost their last two. Fresno has also lost six consecutive games to the Round Rock Express, with the last Grizzlies victory occurring on August 5th, 2010 at Round Rock. Round Rock switched affiliates, however, in 2011, going from the Houston Astros to the Texas Rangers. Therefore, Fresno has been defeated by the Texas Rangers’ Triple-A affiliate in their last four meetings. Fresno beat Oklahoma City, then the Rangers’ Triple-A team, on May 18th game for the last Grizzlies victory against the Texas organization. Nick Noonan currently owns an 11-game hitting streak, tied with Roger Kieschnick for the longest by a Grizzlies hitter this season. Noonan is batting .313 (15-for-48) over the 11-game stretch. Noonan’s career-high hitting streak is currently set at 14 games, which he achieved from May 31-June 19 in 2008 with Single-A Augusta. Nick Noonan is looking to extend his hitting streak to 11 games, which would match Roger Kieschnick for the longest hitting streak by a Grizzlies hitter this season. Noonan recorded one hit last night to give him 10 consecutive games with a hit. Justin Christian is also in the midst of a hitting streak, with his sitting at nine games. Christian has multiple hits in his last four games, including a 2-for-4 performance last night. Over the nine-game stretch, Christian is batting .400 (16-for-40). For the season, he is batting .378, which is second best in the PCL entering today. The Grizzlies need a win in today’s game to salvage a tie for the Omaha series. If the Grizzlies were to lose, it would be their first back-to-back series losses since August 12-19, 2011 against Albuquerque and Round Rock. Fresno has not lost a series to Omaha since 2003.